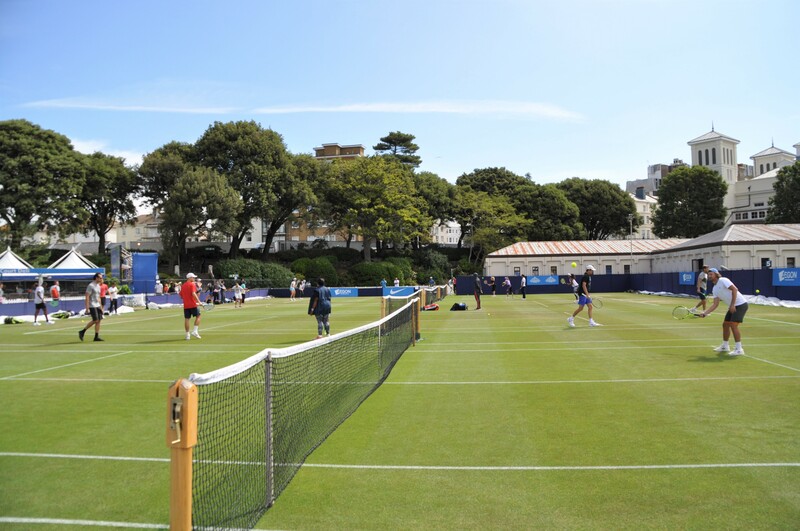 After two cold and windy days, the sun came out on Monday for a glorious day at the 2017 Aegon International in Eastbourne. Dare I say that it was actually warm! This could all change on Tuesday and Wednesday with the miserable looking forecast but i’m in a good mood so I will stick with the positives for now and remain optimistic. I was in the grounds again at 10am and started off with practices. I spotted Naomi Osaka for the first time. I overheard her coach, Dave Taylor talking to Francesca Schiavone who was asking her what her current ranking is, before proclaiming “you’re back, you’re back”! Players practising included Barbora Strycova and Karolina Pliskova, Alison Riske and Veronica Cepede Royg, and Eugenie Bouchard and Risa Ozaki. Angelique Kerber was also out practising but since I spent an hour watching her practice on Sunday, I ended up watching some of the other players. To be honest, i’m not enjoying the practice sessions so much this year with double black netting in front of one of the courts and many of the players having to share courts. It’s hard to get any pictures and i’m sensing quite a lot of players are practising off site this year. At 11am, I headed for court 3 for what I thought would be a very close and interesting match between Katerina Siniakova and Sorana Cirstea. Siniakova secured the early break of serve but that would be the only occasion in this match where she was ahead as Cirstea delivered a superb display to win in straights, 6-3 6-2. Most impressive was how Cirstea was so consistent with her groundstrokes and frequently forced Siniakova into forced errors into the net with her depth. Siniakova just couldn’t get her game going and she looked tearful in the changeover between the first and second sets. In the second set, Cirstea just didn’t let up and went from strength to strength as she soaked up pressure from Siniakova (the Czech player started overforcing) and served brilliantly – Cirstea dropped just four points on serve in the second set including a confident final service game. 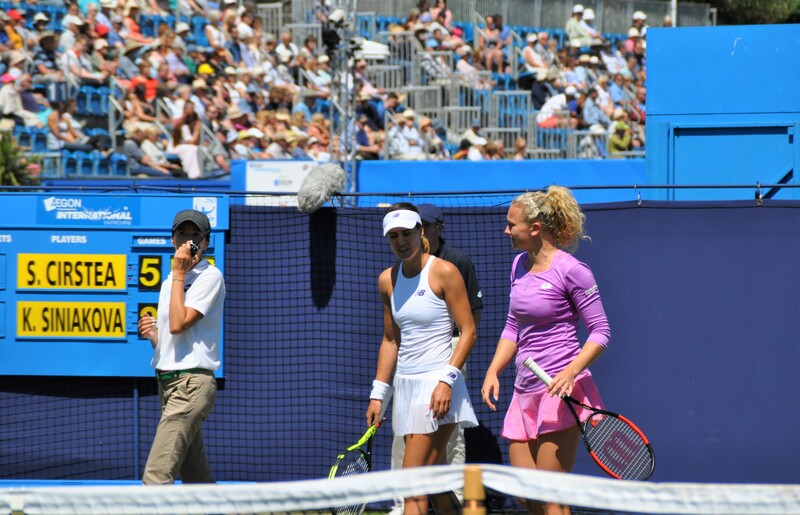 There were no signs of nerves or wobbles, and it was a classy close from the Romanian player. Also classy was Cirstea’s reaction to the match point where Siniakova had a nasty slip on the grass. Cirstea went over to Siniakova’s side of the net and checked on her, which was nice to see. Siniakova looked tearful again but she did manage to get up and walk back to the chair so hopefully nothing too serious. Cirstea gets Jo Konta in the second round – a Fed Cup rematch! After the conclusion of Siniakova-Cirstea, I turned around to the adjacent court where Christina McHale and Duan Ying-Ying were playing their first round match. I’d heard some “come ons” from McHale and noticed she was a break up in the first set. Things had taken a turn when I joined the match with Duan running away with the second set. McHale had heavy strapping on her elbow and had taken a medical time-out. She was being supported by her sister and her husband, Ryan Harrison, who had just lost a doubles match around the corner on Court 5. Duan was smacking away winners and eventually it was too much for McHale who retired. Duan was leading 6-3 4-0, and next plays Halep in a match first up on Tuesday’s schedule and one I am intending to watch. Then I swapped around with Ryan and headed to Court 5 for an all-Japanese battle between Naomi Osaka and Risa Ozaki. Court 5 is a new match court having previously been a practice court. It’s adjacent to the media centre and is rather hidden so didn’t attract much of a crowd. I expected a really close match but Osaka was just awesome. Really, really impressive. From all the hard hitters i’ve seen this week, Osaka’s groundstrokes are the ones that have wowed me the most. I’ve only watched her once before live at the US Open where I was more focused on the fact I was melting. Osaka’s power today was just too much for Ozaki and she managed to control it and not overforce or go for too much. If Osaka can keep this form up then she will give Caroline Wozniacki some problems in the second round. Osaka through, 6-0 6-1 in just 54 minutes. Emphatic win for Pliskova. She gave a really interesting interview where she talked about how shes improving her B and C games and winning big matches when not playing her best tennis. Interestingly she thought she didnt play well in Brisbane or Doha! I think she’s the favourite for Wimbledon with the bookmakers? Thanks for the info, missed her match today but hope to watch her R3 match. Shes been my favourite since the beginning of the year. Obviously Kvitova is now also a major player.